What started as a day at the creek with his son, ended in a dramatic turn of events that would forever alter Michael Patterson's life. Man saves little girl from drowning in creek in Rockmart, Ga.
Michael Patterson and his 9-year-old son Cole were enjoying an afternoon at Euharlee Creek when a bloodcurdling scream put a stop to things. Patterson, 43, heard cries of help coming from a woman downstream. Carlissa Jones watched helplessly as her 4-year-old daughter was carried away by the creek's powerful current, Today News reports. That's when Patterson sprung into action and dove into the creek. But in the process of saving the young girl, the 43-year-old badly injured himself. 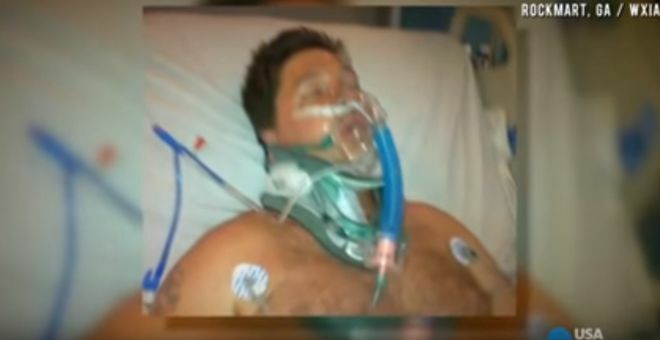 Patterson broke his neck during the dive and was paralyzed from the waist down. Somehow he was able to help the 4-year-old out of the water before going unconscious. Patterson was taken to the hospital where he fell into a coma. While news of Patterson's heroism spread rapidly, he fought for his life in a hospital bed. After three weeks, the father and husband passed away, according to Yahoo News. Patterson will long be remembered for his courageous act and his selflessness. You can see a news report on the story below. Comments Man saves little girl from drowning in creek in Rockmart, Ga.